If you're serious about this hiking stuff-- requiring top-of-the-line boots and a GPS unit to get you to a summit somewhere, with the challenge to excel, prove, and conquer--this hike isn't in the equation. If you're the kind of hoofer who treks more for the experience of the road rather than the destination itself and who does not equate degree of enjoyment with amount of calories burned and sweat produced, this may appeal. Visit Sabino Canyon. Do an up-and-back on the pavement or one of numerous off-road trails. Burn up the endorphins and shake out the kinks. Take the tram if you must, and let somebody else do the work. 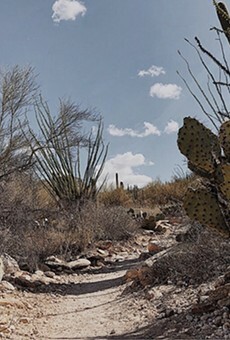 But before the day ends, find the pathway to Sabino Creek Dam and prepare to find inner peace. When water flows, it adds a whole new element, greening the vegetation and soothing the soul. Even in the summer months, when the only moisture is some raindrops in an otherwise dry riverbed pool, it's a place worth visiting for the serenity. Listening to the wind blow lightly through the trees as cardinals and hummingbirds play provides a restorative power.